2K's hit turn-based strategy title will be finding its way to iPad, iPhone and iPod Touch this summer. There was a point, not too long ago, when 2K Games had branded strategy titles as not being "contemporary." 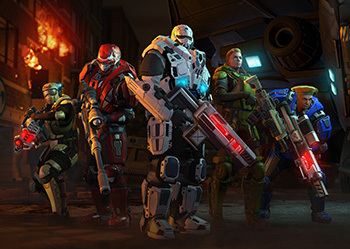 It was an attitude that prompted the publisher to reboot XCOM, a beloved strategy franchise, as a first person shooter. Disappointed fans rejoiced when 2K eventually announced that Firaxis Games would be developing a turn-based strategy XCOM to stand alongside the FPS game. To the delight of gamers, XCOM: Enemy Unknown was a great game and sold well enough to earn 2K Games some substantial profits. Since then, there have been no notions of non-viability when it comes to strategy titles. 2K and Firaxis have released several updates for Enemy Unknown, and have been working hard to bring it to platforms beyond the original PC, PS3 and Xbox 360 release. 2K recently confirmed an April 25th release date for the Mac port at this year's PAX East. In a surprise turn, it also revealed that the game will be making its way to iOS devices. While the Mac port has been in the works for some time, the iOS version is new. In addition to an iPad port, 2K has confirmed that the game will also be coming to iPhone and iPod Touch, essentially turning Enemy Unknown into a portable title. Any sacrifices made during the porting process are expected to be fairly minimal. "The idea was to port the game fully," said Jake Solomon, lead developer of Enemy Unknown. "The one exception we made was to the number of maps in the game, but we still have all the destructible environments, there's the fog of war - this is a full AAA game we're porting. It really is XCOM." Solomon also believes the turn-based nature of Enemy Unknown will help the port circumvent many of the control pitfalls that often accompany touch-based titles. "I think that moving your soldiers feels super intuitive with touch controls," said Solomon. "It was one of those things that was a challenge for us to figure out on consoles where you steer the cursor with the gamepad. It was actually much easier on the iPad because it mimics the PC in the sense that it's easier to steer your soldier, because all you do is look at the screen and click." Though no specific release date has been announced, 2K has indiciated the iOS version of XCOM: Enemy Unknown will be available this summer as a premium-priced app.